The group met for the first time in Los Angeles on Thursday and continue their gabfest on Friday. UC Los Angeles, UC San Diego, Colorado State University, the University of Arizona, the University of Illinois Urbana–Champaign, the University of Memphis, the University of Michigan and Washington University in St. Louis have all joined the effort. Korea's Anyang University, China's Tongji and Tsinghua Universities, the University of Basel (Switzerland) and Japan's Waseda University are also taking part. Intel, Huawei, Alcatel-Lucent, Qualcomm, Comcast and Orange are also contributing to the effort to create the new protocols. Work on the Named Data Networking (NDN) has been going on for some time: the National Science Foundation has been pumping in cash since 2010. The significance of this launch is that industry is now involved, and the consortium is committed to producing open-source software to take researchers' work beyond the hypothetical. “That is very difficult for Internet protocols to handle,” he said, “but something at which NDN excels.” Crowley goes on to explain that NDN will be able to inform users if data on a bank's site was produced and signed by that bank. IP has no way to perform such a verification. NDN will therefore improve internet security. Under NDN, the name in a packet “can be anything — an endpoint, a chunk of movie or book, a command to turn on some lights, etc.” By allowing more specific addressing, NDN offers greater control. 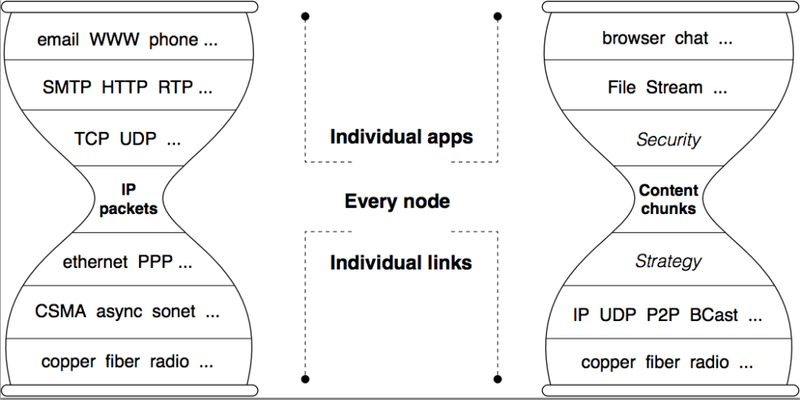 The consortium also says its approach won't break the current internet, with the diagram above showing how both offer a “thin waist” allowing communication among many different entities. The consortium hopes to publish “A specification of the standard formats for the two packet types, Interest and Data, in NDN data delivery” so that both simple carriage along the lines of TCP/IP and NDN's more nuanced approach to verifying content's source and connecting entities to content can be achieved.